Jonathan and Tessa Dowell visited San Salvador in The Bahamas in November. The purpose of this trip was to gather photographs and video about the island and the marine life of its reefs for a new CD-ROM "San Salvador: Jewel of the New World." This issue of e-ReefNews features two pictures from this trip, and we plan to bring you more pictures from this trip on e-ReefNews throughout this schoolyear. 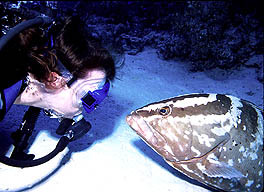 This friendly Nassau Grouper swam right up to Tessa for a close look. Click here for more about this ambassador of the Caribbean reefs. 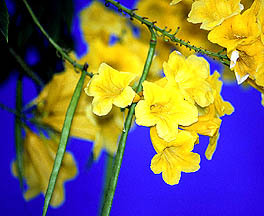 The Yellow Elder is the national flower of The Bahamas. Click here for a close look at this beautiful flower. Copyright © 2002 ReefNews, Inc.